European Union boss Jean-Claude Juncker has charted a course for a much more powerful superbloc of nations in his controversial State of the Union address. With Britain leaving and the continent's economy growing, its federalists are now taking the chance to push for a big leap forward. The most notable for prophecy watchers is his call for combining the EU's two presidental positions -- the European Commission, responsible for the bloc's day-to-day running, and the European Council, which brings together the national leaders -- in a single post, filled after a Europe-wide election. "To understand the challenges of his or her job and the diversity of our member states, a future president should have met citizens in the town halls of Helsinki as well as in the squares of Athens," Juncker said. Electing a single leader for the bloc has been suggested for years but rarely has the role and responsibility of such a position been outlined. This new leadership position would also be emboldened by what the European Commission Presidents envisions as a new European Defence Union that all member stats would join - essentially an EU army. Several member states led by Germany and France have already taken incremental steps to consolidate specific units, divert defense funds into sequestered accounts and create new coordinated command structures. For the first time, the EU created in March a joint military command center. In fact Gernmany's foreign minister has expressed hopes of a European superstate becoming a global player in international politics, in the midst of growing tensions between Russia and North Korea. Foreign minister Sigmar Gabriel said it was time Europe found its "own voice" instead of letting the US dictate global affairs while the continent argues amongst itself. Part of that unified push sees an oppotunity for Bulgaria, Romania and Croatia to finally become full members of the Schengen borderless area while the President of the Ukraine is pushing for an immediate seat at the EU table to become the bloc's 28th member. This would stretch the power of Brussels thousands of miles from Ireland to the borders of Russia. Ukrainian President Poroshenko called for Ukraine to be seen as the "new eastern border" of the European Union, a union which he said should accept the vision of Juncker and become "closer". He said: "The idea of European integration must get a second wave. Will this second wave create a fully unified EU that could soon be a military to rival that of the United States in size, capability and cohesion? The bureaucrats in Brussels would like nothing more. 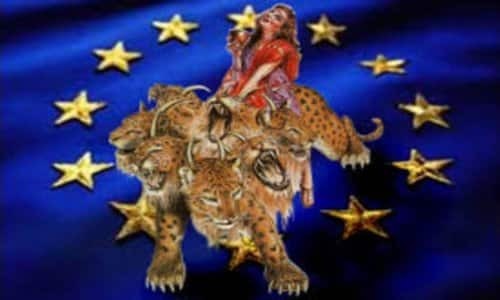 Bible prophecy watchers have long speculated that the EU could represent be the final "Beast" empire talked about in the book of Daniel and Revelation. The potential for a new more powerful/federalist Europe with a single president to lead it has ramifications not only politically and economically but prophetically as well. Surprisingly, even The Economist magazine recognized that this was an important factor for some Protestants voting to leave the Union in their article: "Protestants, leaving Europe is a matter of eschatology". These evangelicals believed that remaining in the EU put them at risk of eventually joining the "The Beast's" final world empire. Why did they believe this? The Bible speaks of several different beasts. Each one is used symbolically to give insight into different aspects of the final world empire and it's leader, and when studied together give us a much better picture of what to expect in the Last Days. Revelation 13 speaks of a beast in its first 7 verses. Another beast, ridden by a woman, is described in Revelation 17. Daniel 7 speaks of four separate beasts, with a reference to a "little horn" that appears during the time of the fourth beast. Revelation 13 also describes a second "two-horned beast," beginning in verse 11. These beastly images are also to be understood in the context of the giant image of a man composed of four separate metals in Daniel 2. Relative to most of these descriptions, in describing this final world empire is the number 10; 10 toes, 10 heads and 10 horns. Each give us different understanding but all point to an alliance of 10 nations or leaders that will one day be controlled by the "little horn", the Antichrist. It remains to be seen how the number 10 figures into this new European push but some have suggested as the EU enlarges it needs a smaller council to help it be administered. A European council of 10 that represtents the bloc of nations to the EU president is an interesting possibility. Will a new, powerful and charismatic leader emerge on the scene to lead Europe? European Commission Juncker is already pushing for the spread of the Euro to non-European nations. This would certainly spread the economic power of the joint bloc as well. We do not know how these proposals will ultimately play out but we do know eventually this prophecy will come to pass. Recent events represent serious change for this region and the world. It is an area that the Bible has a lot to say about in the Last Days and we encourage you to become familiar with the different passages in Daniel and Revelation that reveal what the final world empire will look like. Several prophecy experts recently came together to produce a new 10 hour DVD series called "Decoding The Future", that walks you through the Book of Revelation, chapter by chapter. This resource will equip you with a better understanding of how these "beast" passages fit into the larger context of Revelation and the Bible itself.